The Cumberland & Dumfriesshire Farmers Mart PLC had forward 2,786 breeding ewes and shearlings, also 40 rams at their special sale at Longtown on Tuesday 15th September 2009. A very good show attracted many buyers with all classes dearer than a fortnight ago. Included in the sale were two dispersals, the first from Messrs Cartner, Arkleton, which were Cheviot Mules. Top was £95, £92 for Shearlings, £84, £82 for 1 crop, £75 for 2 crop. 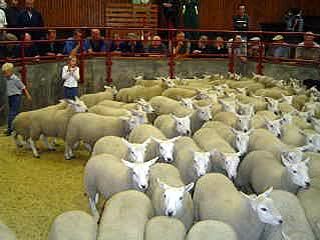 The second dispersal was form Messrs Douglas, Upper Ashtrees which were Texel x Cheviots. Top was £113, £110 for 1 crop, £98 for shearlings, £74 ¾ crop, £98, £94 shearlings. Both lots were well shown and sold well. The sale was topped at £125 for 2 shear Beltex ewes from Whitehill Cottage; Greyfaces £102 Flatt; Correct ewes sold to £91 for Beltex from Whitehill Cottage; Texels £78 Kirkhouse; Greyface £76 Kilncroft, £72 Gall & Broom House who sold Charollais at £72; Cheviot Mules £70 Maxton House. Gimmer shearlings sold to £124 for Texels from Dunjop; Beltex £112 Whitehill Cottage; Greyfaces £110 Baron House, £106 Wanwood Hill & Dairy Farm, £105 Gall, £104 Porterstown; Cheviot Mules £97 Springkell. A good show of rams met an animated trade and were short of requirements. Top was £1000 for a Texel shearling from Messrs Irving, Kingfisher who sold others at £450, £380, Others to £440, £400 Four O Boot, £340 Doorpool; Suffolks £380, £360, £350 Bridgepark; Leicesters £280, £260 Harden.